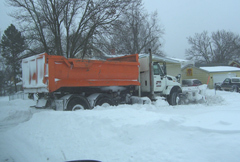 Iowa cities had been moving along without having to spend a lot on snow removal until the recent blizzard took a bite out of any early savings. Mason City operations and maintenance manager Bill Stangler says they are doing okay even with the recent storm, as they plan on snow anytime after Halloween. “We actually are in very good shape budget wise because it didn’t start in November and it’s a little bit more forgiving than if it starts in the first part of November,” Stangler says. Stangler says while it was a heavy storm — approximately 10 inches — the cost of cleanup was about the same as if Mason City had received several smaller snowfalls by now. Stangler says the city budget has also benefited from very reasonable prices on salt this year. Des Moines is another story, as Public Works Director Bill Stowe says cleaning up the 16 inches of snow that fell in the capitol city has cost well over $300,000. He says it’s $300,000 plus that they would have preferred to use on something else and says in these crunched budget times it certainly is a worry. Stowe says they’re still going to do what needs to be done to deal with a natural disaster in the form of a blizzard or snow and ice control and then pay the consequences later through less maintenance on our streets. Stowe says Des Moines and other cities its size face some unique challenges when there’s that much accumulation. Road crews not only plow the streets but must also remove the snow completely from congested areas like the downtown. Stowe says that’s what makes heavy snowfalls so expensive.